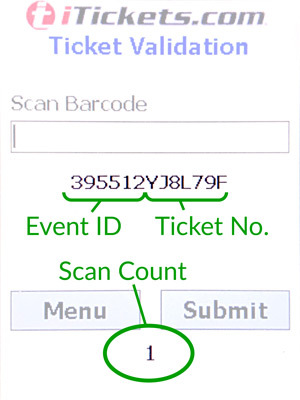 When you turn on the scanner, if it already shows the iTickets Event Setup screen, skip to Step 2. 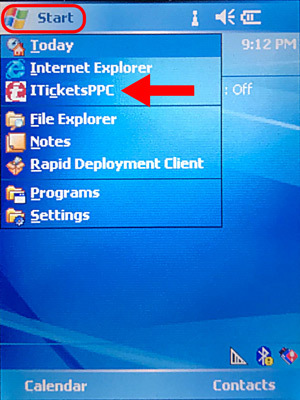 Otherwise, navigate to the home screen and select Start > iTicketsPPC. Type your Event ID and press Submit. 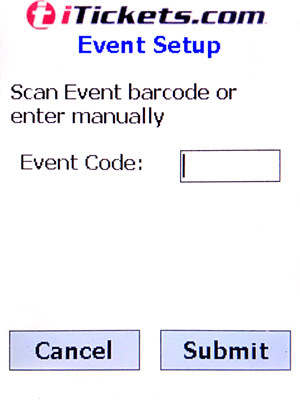 If you rent scanners from us, your Event ID will be included with the shipment. Make sure the text field is selected. You'll see a blinking | cursor as though you're about to type there. 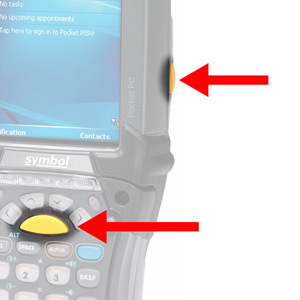 Point the scanner at a ticket barcode, and press one of the yellow buttons on the front or side. If this produces no laser beam, see Configure Laser. You will hear a camera shutter sound, and the scan count will increment. You will hear a buzzer sound and see an error message. Some tickets print with a small barcode at the top near the receipt details, which represents the entire order. If you scan this by mistake, it will give an error. You need to scan the barcode on each individual ticket. It's very easy to accidentally scan the same barcode twice in a row. Don't be alarmed when this results in a Duplicate Ticket error. 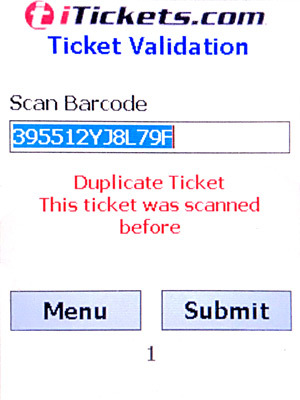 If the scan count increments, the ticket is good. If you've already completed Step 1, select Menu > Logout. Type password 123123 and press Exit. From the home screen, select Start > Programs > File Explorer. 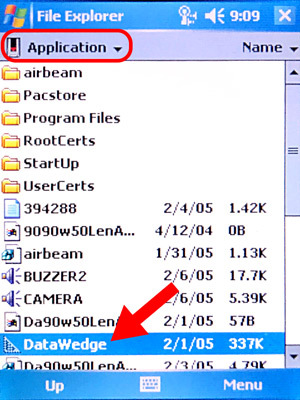 Find My Device/Applications/ and select ScanWedge or DataWedge. Wait for it to run, then exit to the home screen. Test the laser, then Launch Program again. 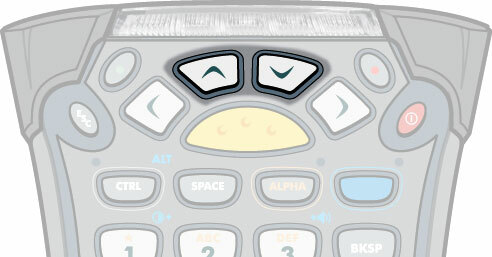 Scrolling is easier with the physical buttons.